Yahoo! mail is fighting against all odds to make itself remain relevant to the present day Internet user. In order to connect with the growing needs of huge file transfers in today’s day and age, the mail arm of Yahoo! has teamed up with Dropbox to make attachments easier. “As we've said before, we're focused on making Yahoo! Mail easy. The way we see it, you should be able to go into your inbox, do what you need to do and move on with your day. That’s why we're excited to announce a new partnership with Dropbox that makes it easier to send, receive and manage attachments in Yahoo! Mail,” wrote David McDowell, Senior Director of Product Management at Yahoo! Mail, in a blog post announcing the partnership. Starting today, Yahoo! mail users will be able to access Dropbox from within the inbox. You will be able to add files from your Dropbox to any email. It will also be possible to save attachments to Dropbox as well. 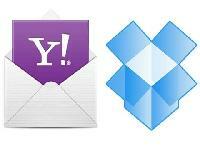 Of course, you will need to sign up for a Dropbox account, making it a win-win situation for both Yahoo! and the cloud storage service. When you now receive a mail with a heavy or important attachment, you can click on it and select “Save all to” followed by “Save to Dropbox” to keep a copy of the attachment in your Dropbox. A default Yahoo! Mail folder will be created within your Dropbox account and all the files you save from your inbox will be sent to it. This way, it becomes easier for you to search for particular files you’ve received in your inbox. You can also choose to save it to another folder. If you need to add files from your Dropbox, click on the paper clip icon in the compose section and click on “Share from Dropbox”. You can send files larger than 25MB using this method too, but it must be noted that those files will be sent via Dropbox. Interestingly, despite the fact that Dropbox is partnering with a mail client like Yahoo!, it has just finalised the purchase of a mail app of its own, a service called Mailbox. The purchase of the critically acclaimed email app was made merely a month after it was launched. All 14 members of Mailbox’s team are set to join Dropbox, according to The Wall Street Journal. While the terms of the takeover and the price at which the deal was sealed were not revealed, it is being speculated that the price tag could have been anywhere between $50 million to $100 million. It is being reported that the deal could have well been towards the higher side in cash and stock. Co-incidentally, Yahoo! too had made a failed bit to purchase Mailbox, making Dropbox and itself strange bedfellows. Dropbox, besides going on a purchase spree has also been looking at improving user experience within its services. Earlier last month, Dropbox gave a facelift to its desktop apps and added features like thumbnails for recent uploads and a faster notification centre to keep the user updated.